This is a ONE-OF-A-KIND FT1000D so if you're interested in clean wb Tx and Rx audio, this is the rcvr for you! This was the first Yaesu HF radio to be modified for ESSB. Be sure to read the details in the next section b/c this radio showed that a Yaesu radio could be an ESSB player. The picture shows how it looks today; no dents, some minor scratches and no smoking "odors"! The rcvr and transmitter operates perfectly! Comes with the following items; AC Pwr Cord, MD-1 Desk Mic, MH-1 Hand Mic, Original Yaesu Filters (4), Owners Manual and Service Manual. Price is $1300. Will ship in the original box via UPS Ground to any contiguous US destination. 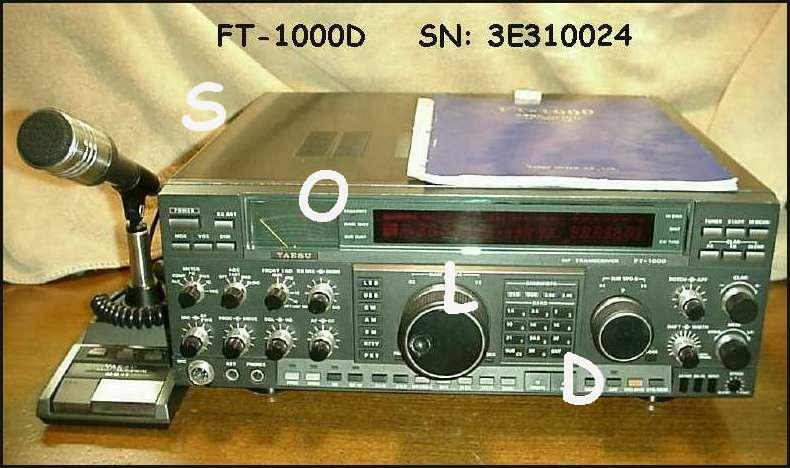 Introduced back in the late 80's, the Yaesu FT-1000D was a sensation with DXers, Contesters and the general Ham public. Over the years it has proved to be very reliable and rugged radio, surviving many DX-expeditions and most anything else thrown at it. I purchased mine in 1993 and it has been 'down' just one time, with ohmic contacts in the changeover relay and some 'blown' switching diodes on the Low Pass Filter Board. About a year ago (1998), I got bit by the hifi audio bug (later renamed to "ESSB") thanks to people like W2ONV (alas a SK) and VE6CQ. What's funny about this, I said I'd never get interested in extended audio because it didn't make sense! Since I had this great radio as a starting point, I thought why not use it? It should produce excellent sounding audio since it has very low distortion products and its SSB audio was good, however a bit narrow. With some new filters, a few audio part changes and carrier offset adjustments, I should be in business. I was right! What came out of this experiment was a radio with pristine audio plus a radio whose receive bandwidth was not any more than it was with the stock Yaesu filters at the 60dB point (InRad 715 and 716 filters)! At the time this project was started (1998), Yaesu was NOT visible on the ESSB radar. Most ESSBers were using Kenwood radios which already had introduced DSP into their products. With that as a backdrop, I undertook making the FT1000 ESSB capable w/o DSP. Using my EE design experience, I started to analyze the circuits using Spice. I could see, by inspection, that the circuit values caused the severe frequency rolloff which was confirmed by Spice. It quickly determined that most all of the audio (mic, preamp, speaker audio) and IF ckts were severely rolled off, intentionally so. It also showed what values were needed to make the circuits attain wb audio. The easy part, for me, was now done. The next hurdle was the lack of suitable filters for the radio. I contaced George, W2VJN (former owner) at International Radio and convinced him that these new filters would be a saleable product. So using my design specs, InRad developed the required filters, namely the 2.9Khz @ 8.215Mhz (#716), 2.9Khz @ 455Khz (#715), 6Khz @ 8.215Mhz (#710) and a CMF 6Khz @ 455Khz. I also wanted all filters to plug-in where possible, so a versatile filter mounting board was designed that allowed all of the newly developed filters to be used in the FT1000. Needless to say, the ckt changes plus the filters did the "job" as the picture shows. Taken by Rick, VE6CQ directly "off-the-air" using his wb Kenwood rcvr. With these new "parts" now developed, other Yaesu radios such as the FT1000MP could be modified. Even the ckt design methodology in the special menus here, showed "how-to" modify the other Yaesu radios. This FT1000 was the key to all other Yaesu ESSB mods! It appears that this information was lost. Others are taking credit for something which could not have been done without the "parts" arsenal and ckt analysis techniques developed here. So now you know what came first . . . the FT1000 truly was the chicken and the egg! Use the information here to make your FT1000 an ESSB performer. After investigation into the new FT-2000, I found that it employs DSP so the Rx channel (and Tx) can be opened to 4Khz without additional filters. A nice feature indeed. But other changes (Tx audio) are needed and those will be reported here on the FT-2000 ESSB pages. Click now to see the current progress. The information on the following pages centers around the FT1000 but there is also much general techniques for attaining improved SSB audio. In the "FT1000D Modifications Main Menu" section, various modifications to the radio are detailed complete with pictures. This section will be of particular interest to FT1000 owners and of general interest to owners of other radios. In the "Audio Techniques Menu" section, information of general use for SSB audio techniques, microphone tests, typical audio system interconnection and links to equipment manufacturers can be found. These are applicable to any radio. Please enjoy. 2/26/15 (1) Replace Yaesu filters with new International Radio crystal filters and replace four capacitors on AF Unit Board. 3/5/01 (2) Readjust the Transmit Carrier Point (TCP) to be more compatible with the wider bandwidth audio. 9/02/00 (3) Directly modulate radio via balanced modulator. 7/9/00 (4a) Improved Transmit MONItor function by IF filter replacement in 2nd Receiver. 9/11/00 (4b) Flatten Tx MONItor response with 6 cap changes in 2nd Rcvr and SHP Board. 10/15/01 (5) Improved VOX operation by tuning it to the male voice. 7/23/00 (6) Improved cooling from the FAN while quieting the noise. 9/21/08 (7) Replace the 455Khz filter with Collins Mechanical Filter. Tests complete! 8/19/00 (8) Improved Rx bandwidth: Flat from 60hz to 5Khz with three parts change. 9/21/08 (9) SP-5 Companion Speaker with Timewave DSP-59Y unit tested. All of these are documented with photos showing both how-to-do and results of the modifications. Enjoy! 9/21/08 (1) What is good audio?? How do I get it? 9/21/08 (2) How do I adjust my audio equipment to get good transmit audio? 9/21/08 (3) How do the Marshall MXL2003, Neumann TLM103 and EV RE27 mics compare? 9/21/08 (4) How does the Marshall MXL V77 Tube mic compare with the others? 9/21/08 (5) How do I remove the AC hum from my audio equipment? 2/25/01 (6) Are 'Groove Tubes' warmer?